AP LAWCET Application form 2019: Andhra Pradesh Common Law Entrance Test (AP LAWCET) 2019 exam will be conducted on 6th May 2019. The application forms are supposed to release in February 2019. Interested candidates can fill the application form through the online mode. Andhra Pradesh Law Entrance Test (AP LAWCET) is a common entrance test for the students who want to join the LL.B programme. Those who want admission have to fill the AP LAWCET Application form 2019 and pay the registration fee online/offline. Read below all the important instruction for AP LAWCET 2019. In this post, you will get all the information related to the AP LAWCAT exam 2019 like application form direct link, important dates, eligibility, exam pattern, registration fee and how to fill application form. AP LAWCET is basically a national level entrance test conducted every year. It is managed and conducted by Sri Krishnadevaraya University, Anantapur on the behalf of APSCHE, Hyderabad. The entrance exam is conducted to select the suitable candidates for admission into LLB 3 years and 5 years programs in the various law universities and colleges of the state. Check back here to direct link to apply online for AP lawcet 2019. If you want to make your career in the field of Law then this entrance exam can offer you the opportunity to choose the best college for your studies. ^If submission with fine of Rs 5000 then examination center will be Anantapuramu. It is expected that the notification for AP LAWCET will release in the first week of March 2019. The important dates, associated with AP LAWCET exam have been mentioned below. The online application submission process for AP LAWCET will start in March 2019. The AP LAWCAT online application 2019 will be available for the students from the first week of March 2019. Candidates can fill the online application for AP LAWCAT 2019 till the first week of April 2019. The last date to apply for AP LAWCMAT with late fee will fall in the second week of April 2019. The date of AP LAWCET has been announced and the exam will be conducted on 6 May 2019. The timing of the exam will be from 2:30 pm to 4:30 pm. Applicants are advised to check their eligibility criteria before filling the application form. Any candidate found ineligible at any stage of the candidates will be disqualified from the admission procedure. Candidates must belong to Andhra Pradesh and must have a domicile. There is no specified age criterion. To apply for LLB 3 years course the minimum age of the applicant should be 21 years. There is no upper age limit has been mentioned by the authorities to appear in this entrance exam. If you want to apply for the 3 years programme of LLB then you must have completed your graduation from a recognized university in any subject with minimum 45% marks. For SC, ST Candidates its a must to score 40% marks in graduation to apply for AP LAWCAT 2019. In case of having less than 45% marks in graduation, the candidate will have to pass an additional graduate or postgraduate degree examination and score a minimum of 45% marks in it. Candidate in the final year of graduation can also appear in the AP LAWCAT exam. To apply for LLB course of 5 years your minim age should be 17 years. For this course also no upper age limit has been decided. To apply for 5 years course of LLB the candidate must have completed his/her 12th from a recognized board. To apply for AP LAWCAT 2019, the candidate needs to score a minimum of 45% marks in intermediate. Candidates belonging to SC, ST categories can apply for AP LAWCAT if they have minimum 40% marks in 12th. Note- A relaxation of 5% and 3% in marks in the qualifying exam will be applicable for SC/ST and OBC candidates respectively. The application process for AP LAWCET is easy and you can complete it in just a few steps. To fill the AP LAWCET form first you will have to register yourself on the official website of AP LAWCET. The registration process requires the valid Emil id, contact number, and other personal details. You need to fill following details to apply for AP LAWCET Exam 2019; Personal Details, Academic Details, Course you wish to apply for, preference for exam center and relevant documents like mark sheets, Aadhar cards etc. Date of birth proof (SSC Certificate or Birth certificate). Caste certificate (if belongs to SC, ST or other non-general castes). Certificate of special category (NCC, PH, Sports etc). Once you fill the details, save and continue with the page. Now you will be asked to pay the application fee online. Do the same and take the print out of form for future reference. AP LAWCET 2019 application forms will be released online in the month of February 2019. The application forms will be made available only through the online mode. No printed application forms will be made available. Candidates can fill the form only on the official website. Candidates are advised to keep all the documents and certificates ready with them at the time of filling the application form. They have to refer to the documents for filling the details in the form. Applicants must fill the application form before the due date. All the details should be filled accurately. Candidates are also required to upload a scanned image of passport size photograph and signature in the prescribed format. Candidates must take a printout of the application form and payment slip for future reference. 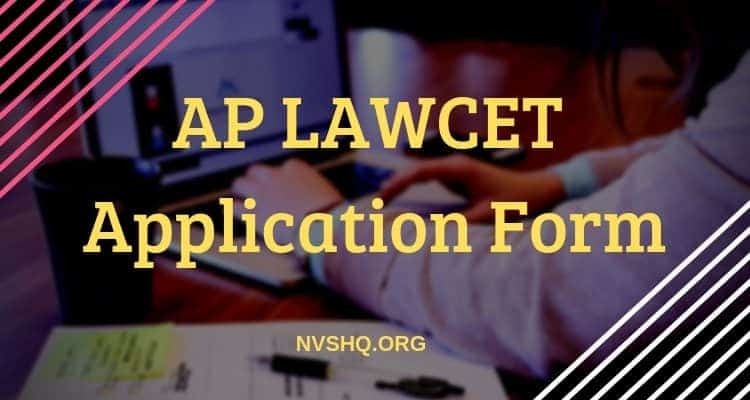 The application fee to fill the form of AP LAWCAT 2019 is Rs. 750 for the students of all categories. They can submit the application fee through credit card, debit card or Net banking. Candidates will have to submit Rs. 59 as processing fee also, so the total application fee for AP LAWCET 2019 will be Rs. 809/- only. All the candidates have to make payment of Rs.750/- (plus processing fee) as the application fee. Application fee can be paid through the online mode (credit/debit/net banking) or through offline mode i.e. cash deposit at AP Online center. 12th mark sheet and admit card number issued by the board. Note- Official dates will be updated soon. The syllabus for LLB 3years will be basically based on the syllabus of the qualifying degree or exam. Questions will be asked form General knowledge, current affairs, questions to test the mental ability and aptitude of the candidate in the study of law. In General knowledge and mental ability questions related to GK and mental ability will be asked. The Current affairs part will have the questions from recent national and international events like awards, sports etc. In Legal aptitude, the questions from the Constitution of India, Elementary knowledge of law principles, etc will be asked. LLB 5 years syllabus will be based on the syllabus of 10+2, therefore, they can refer their 10+2 books. AP LAWCET 2019 exam will be conducted in online mode i.e. it will be a Computer Based Test. The language of the question paper will be English and Telugu. The question paper will be divided into three parts/sections. Candidates will be alloted 90 minutes to complete the exam. The total number of questions will be 120. No marks will be deducted for a wrong attempt. In this exam total, 120 questions will be asked from the aforementioned topics. The questions will be asked in MCQ form. For every right answer, the candidate will get one mark. The exam does not follow the negative marking so the candidate can answer the questions freely. Anantapuramu, Chittoor, Tirupathi, Kurnool, Nandyal, Kadapa, Nellore, Ongole, Guntur, Vijayawada, Bhimavaram, Kakinada, Rajamahendravaram, Vizianagaram, Srikakulam, Visakhapatnam. Candidates have to select two choices from the given test centers at the time of filling the application form. However, conducting authority reserves the rights to allow any other centers to the candidates. Andhra Pradesh LAWCET 2019 Admit card will be released online in the month of April 2019 a few days before the date of exam. Admit card will be issued only to the registered candidates who have successfully filled the application form. Candidates have to download the admit card from the official dates only. No printed copy of admit card will be sent individually to any candidate. It is necessary for all the candidates to carry the admit card to the examination venue on the day of the exam. Any candidate found without a valid hall ticket will not be allowed to write the exam. The result will be declared online in the 2nd week of May 2019. Candidate can check the result on the website by login with the valid details. On the basis of the marks obtained in the exam merit list will be prepared. Depending on the merit, candidates can participate in counseling. The result will be published online with qualifying marks and ranks of the candidates. Once the result will be out after that the counseling process for admission will start. The Law applicants will have to complete their AP LAWCET Counselling registration, for this they need to pay the procession fee of Rs. 1000 (Rs. 500 for SC/ST). After making the payment, the candidate can access the list of colleges that offer admission to AP LAWCET pass outs and he/she can choose any college mentioned in the list based on his/her rank and choice. AP LAWCET is the state level entrance exam for the Law courses. The AP LAWCET 2019 exam will be conducted by the S.K. University at the 16 regional exam centers in Andhra Pradesh only. More than 50 colleges participate in this entrance exam and offer admission to the students who pass this exam. The AP LAWCET exam is a bilingual exam and it is conducted in English and Telugu. This entrance exam is conducted to take 3750 students on board for 3 year LLB courses and to fill 1920 seats of LLB course of 5 years. It’s the common entrance exam for both of the courses. After the exam, AP LAWCET releases the merit and according to that merit, the students get admission in Law Colleges. So, the Law aspirants here we mentioned all the details related to AP LAWCET 2019. But if you still have any question in your mind then feel free to ask us about it. You can write your query to us in the comment box below, we will be happy to help you.